Give your home a touch of romance with these charming pillow shams. Featuring eyelet ruffles in a crisp white or warm ecru, these shams complement any decor with traditional elegance. The shams or machine washable for easy cleaning. Got these a couple of days ago and as I was taking them out to wash before using them I noticed just how incredibly soft these shams were! I wish they made pillow cases as soft! These are very well made, pure white, and I expect them to last through many washings! Good overall experience with Overstock. Prompt delivery and items in good condition. The product however, was not quite what I expected. There wasn't a good representation of the product. It was only shown in white and I ordered it in the ecru color. The ecru color was only shown in a small inset under the actual white pillow shams and there is no ability to click and change the color. Therefore, I could not get an accurate view of the eylets. When I received the shams the shiny eylet threads were a little too yellow and I was looking for more of an off white color. I put them on my bed and they looked okay so I am keeping them. They are actually quite pretty, but not exactly what I wanted. I could not afford the small pillow & euro shams that would have finished off the bedset I had just bought. These pillow shams did the trick . They held a verry fluffy pillow and that propped up the pillow shams I did buy. The bed looks great! I would advise taking a sham with you and buy a pillow that that will give you the look you need. Extra fluffy, Soft, Stiff etc. The fabric is thin as mentioned before so use a solid white pillow insert. The ruffles are good size and give the sham some substance. All in all? Very happy with them! Purchased these pillow shams in ecru color to coordinate with the curtains in my bedroom. Very pleased with the quality of the shams. Had previously purchased pillow shams from another company and was unhappy with the quality of the material used. 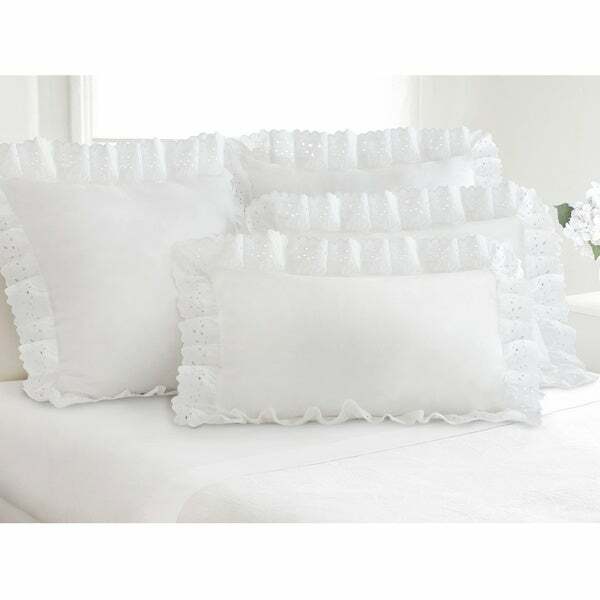 These pretty ruffled eyelet pillow shams match the ruffled eyelet 18" drop bed skirt I bought previously perfectly. The ivory color is perfect with my new guest room color scheme. Cotton, not microfiber, makes these shams crisp and expensive. I'm so glad I found these here on Overstock.com; and they arrived so quickly! This was purchased along with the Fresh Ideas Lauren Heirloom Ruffled Eyelet White 14-inch Bedskirt and Greenland Home Fashions Guinevere Cotton 3-Piece Quilt Set to make the perfect feminine room with deep red walls. Could not have asked for a better look on an antique steel bed frame. These are beautiful shams! Great for a summer look with our white comforter in the bedroom! Got the bed skirt too! Love it! Beautifully ruffled pillow shams. I was concerned they might not match the color of the Ruffled Lauren eyelet 18" bedskirt, but it was a perfect match! I´ve been looking for Shams and bed skirt to match for ages, like the Lauren Eyelet fabric. The Shams are beautiful and fit nicely with my rustic style bedroom as well as true fit to European sizes. I´m so pleased I chose the Egu color it looks great, I will probably buy more and would be great if they came in more colors. Also,I encourage European buyers as there’s no extra hidden payments added as you pay in € which makes the final price the same. Love them and they look lovely. These look so pretty on your bed. They are very pretty and nicely made for the price. Beautiful white color. These shams are incredibly soft. Wash and dry well. Remain wrinkle free even with daily use. Excellent quality! I was really suprised at the quality of eyelet lace. This is a good product and I would recommend it. The package arrive earlier than the shipment date which was nice. These completed the look I was after just perfectly. I had looked several other places before finding these shams and oredring them. Thank you. This product is absolutely beautiful! It is a brilliant white and is the shabby chic/ farmhouse look I have been searching for. They are going in my guest bedroom with a light pink, light blue, mint green and white quilt. I would gladly recommend these shams! Like Quality and would recommend to a friend. Looks great on my bed with my blue comforter etc. could have been a little thicker material. But all and all it looks really nice. It's so nice change my bed room looks thank u over stock. Bought these as extra shams and to match a dust ruffle on a bed with a quilt. They are beautifully made and great quality material. I love the way they look on my bed. Highly recommend! Lovely! I wash, starched, and ironed these before putting pillows in them. They are lovely and match so many different bedspread options! Cozy ! Goes perfectly with my daybed set, just as expected! These beautiful white shams will dress up any bedding ensemble! The shams are a perfect fit and are very well made! "ARE THESE JUST THE COVERS OR ARE THEY ACTUALLY THE FULL PILLOW TOO?" They are just the cover so you put your own pillow inside. "Do the shams just have an eyelet ruffle or is the fabric covering the pillow eyelet as well?" It's just an eyelet ruffle. Only the ruffles are eyelet. The ruffle is the only part of the sham that has the eyelet. The rest is solid white fabric. "So these shams match the Lauren ruffled eyelet 18" bed skirt? The bedskirt comes in ivory but these say ecru color?" I bought these is white so they matched fine. "iim ready to check out with 2 items. How do i do this?" Click on the cart in upper right side of screen and follow instructions from there. You will like the pillow shams, I have them and they are lovely. "Do these come in white. I can't use ecru"
The white is currently available by selecting the option from the drop down box.